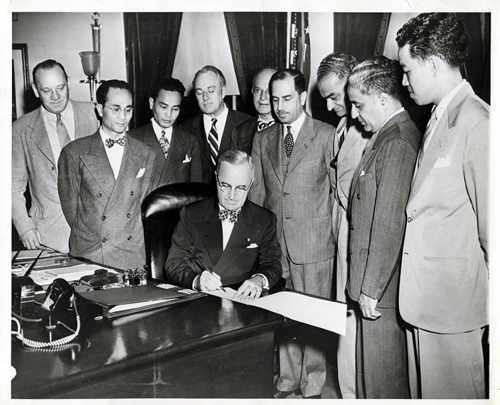 Second from left, the person with the bow tie is Antonio Gonzales, who was the director of the Filipino Community Center in Chicago during the late 1930s. He was elected President of the Filipino Inter-Community Organizations of America in 1949. The man next to Mr. Gonzales is Juan Dionisio, who served as Director of the Philippine Resident Commissioner's Office of the Pacific Coast from 1945, when he joined the Diplomatic Corps of the new Philippine Republic in late 1946. In the 1960s Mr. Dionisio was Philippine Ambassador to Pakistan and later Iran. Both men were very active in all phases of Filipino American community affairs during the 1930s and 1940s. Second from right in striped suit is Dr. Anoop Singh of New York, who later was elected from his home state in India to the Indian Parliament. He died in 1967. 3rd from right is Sardar J.J. Singh, son of the Deputy Commissioner in his home district of Peshawar, Punjab. He was a Washington DC businessman and President of the India League (formed in the U.S. to draw attention to India's struggle for freedom from British rule). 4th from right has been identified by different people as Syed Hussain or as Asaf Ali. All agree he was a New York lawyer paid by the India Congress Association of California farmers to lobby Congressman Luce and Congressman Celler to introduce a bill to restore naturalization rights to Indians.